Merciful God, who didst send thy beloved Son to preach peace to those who are far off and to those who are near: Raise up in this and every land witnesses, who, after the example of thy servant Paul Jones, will stand firm in proclaiming the Gospel of the Prince of Peace, our Savior Jesus Christ, who liveth and reigneth with thee and the Holy Spirit, one God, now and for ever. Merciful God, who sent your beloved Son to preach peace to those who are far off and to those who are near: Raise up in this and every land witnesses, who, after he example of your servant Paul Jones, will stand firm in proclaiming the Gospel of the Prince of Peace, our Savior Jesus Christ, who lives and reigns with you and the Holy Spirit, one God, now and for ever. Lessons reflect revisions made at GC 2009. Paul Jones was born in Pennsylvania in 1880. He attended Yale University and the Episcopal Divinity School [then called the Episcopal Theological Seminary] in Cambridge, Massachusetts. He was ordained and served a mission church in Logan, Utah. In 1914 he was made Bishop of the Missionary District of Utah. He was an outspoken pacifist, and when World War I began in 1914, he spoke against it. As the war progressed, and when the United States entered the war in 1917, many Americans were vehement in holding that pursuing the war was a moral duty, and opposition to the war was immoral. In the spring of 1918, yielding to pressure, Bishop Jones resigned as Bishop of Utah. 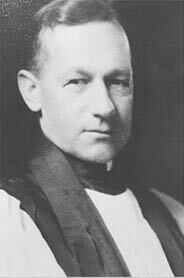 He continued to speak out within the Church as an advocate of peace and the Christian renunciation of war, until his death on 4 September 1941.